A behind-the-curtain look at the life and times of Canadian celebrity interviewer Brian Linehan by one of his oldest friends and intimates. Brian Linehan was one of seven children growing up in the shadow of the Dofasco steel plant where his father and brothers worked. At seven years old he fell in love with the movies and was more convinced than ever that he was not destined to carry a lunch pail. The kid from Hamilton with the broken nose would live and dream bigger than the movies of his youth. By the time he is thirty, Linehan transforms himself into a television host wooed by every major studio in Hollywood. In more than two thousand interviews for his signature show, City Lights, Brian Linehan becomes as famous as the stars he talks to. Some, like Burt Reynolds, will come to him again and again for on-camera therapy; others, like Shirley MacLaine, happily return to City Lights so he can “tell us about our lives.” Viewers come back to hear what he will ask his unsuspecting guests. What secrets, what long-forgotten memories has he unearthed this time? Brian lives the high life on film studio tabs, flying everywhere first class while hanging out with the rich and famous  house-guesting with Bea Arthur and Joan Rivers in Hollywood and New York and flying to Vegas on Paul Anka’s private jet with Ann-Margret. He is entertained by hostesses in Paris, London, and Palm Beach. He becomes the quintessential dinner guest, coveted because he is witty, urbane, and well-informed  and of course he can dish. But when fortified by vodka martinis his rapier wit becomes a force to be reckoned with. Starring Brian Linehan has it all: the wit, the struggles, the insecurity, the famous friends, the secret life behind the camera, and the ground-breaking interviews. 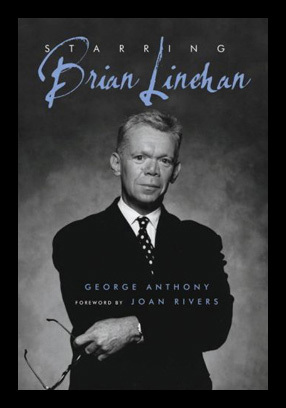 Before ET, Access Hollywood, and STAR, there was City Lights and there was Linehan.